The weather has been kind and it is forecasted to continue today for the first round of the Guyana Motor Racing and Sports Club (GMR&SC) Drag Championship that will boost off at South Dakota Circuit’s drag strip, located in Timehri. 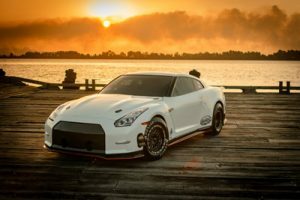 The conditions are already inviting but fans will be keener to witness the new and fastest of the three Nissan GTRs that has been recently added to Team Mohamed’s fleet of machines. The undisputed king of the drag strip, Team Mohamed’s, holds the current strip record of 7.5 seconds and if they hadn’t contributed handsomely to the extension of the straightaway from 1000ft to a full quarter mile (1320ft), that record would have definitely been under threat. The new Ekanoo/Magnus GTR was not so long ago the fastest GTR in the world, setting a time of 7.3 seconds across the quarter mile at a top speed of 206mph. In an invited comment from Kaieteur Sport, Principal of Team Mohamed’s; Azruddin Mohamed, revealed that both the Ekanoo/Magnus and the ‘Goliath’ GTR will be in action today and as usual, he isn’t really fazed by any of the competition. S&D Performance are the closest to Team Mohamed’s in race time and although the best machine from this garage; Shawn Persaud’s Toyota Caldina, has not been able to notch a win against the slower and undefeated ‘Goliath’ GTR, it is unfair to say they are rivals. “The strip has been extended to a full quarter mile so all the winning times will be new records. So we will be looking to set the bar real high”, Mohamed posited. After examining video footage seen by this publication during the GMR&SC test tune on Friday, Team Mohamed’s Ekanoo/Magnus will be a force to reckon with and a bit of advice to the many fans that will be up at the track today is to not bet against the drag car. Tickets cost $1000 for adults to witness the action while kids pay half price and for those desirous of more comfortable seating, there are VIP tickets available for $4000.